Mondays musing arrives late this week due to unexpected life circumstances, which calls the matter of time to my attention. Wednesday is the awaited Winter Blue Moon! A Blue Moon is the rather rare occurrence of a second Full Moon within the same month. Being so close to the Winter Solstice lends an extra potency of magic energy to this already powerful second moon. Any Blue Moon is going to be a terrific time to do spells to help you realize goals, find strength and aide healing, so this moon falling at the end of the year makes for mighty New Year's Resolutions; Be clear and direct about your need, or new goal, and you will find the strength to follow through! A Blue Moon is also a time known for passion and the wishes of countless lovers have been made under its light. Wednesday night offers the opportunity for love spells or to discover the identity of a future spouse, indeed all divination performed on this night will have a boost of prophetic power. So step out into the light and cast a spell, make a wish, or simply admire the celestial beauty. *Conjure This: For general good luck throughout the year take a coin that has been found and bury it in the ground under the light of the Blue Moon. For today's musing we're greeted by the Winter Solstice, 12:47 PM Eastern, USA. This Solstice morning is deeply quiet with no wind at all. I performed a small ceremony outside long before the sun rise; Small to be quick because it is quite cold! The land is enveloped in a blanket of snow & when I was out there earlier a gentle peppering of fresh flakes were falling. The open field behind my patio held a treasure trove of fresh animal tracks not yet frozen; Though the night was still there was obviously much activity hidden around the area. I noted foot prints of several sizes of deer, rabbit, fox, raccoon & what was certainly the neighborhood feral cats. The Earth this morn was vibrant & seemed more alive to me than She had since I experienced Her shake me up as an earthquake; the presence of the Goddess shimmered in darkened stillness. After I finished my ritual I heard a rustling noise to my right. I looked out over the white field to see a silhouette of antlers! I froze in place & for a moment thought I must surely be seeing a log or fallen tree branch, but then remembered the field was clear from harvest. At that moment the suspicious tree branch turned & in moving forward I could then clearly see it was a stag walking over the slight rise of a hill; Oh, he was stunning to behold back-lit by the reflective water of a pond in the distant! Just a few moments prior to this I had been speaking the words of my ritual aloud so I'm certain the deer knew I was there too. He moved a little closer & seemed to indeed be watching me in return. We both stood still for quite some time before I decided he was in fact a little too close & I was a little too far from my patio door. Besides, my fingers were getting numb & the time to go just felt right. Indeed I felt the Divine presence of both the Goddess & God on this Winter Solstice morning! Now, the sun is beginning to rise at last. I think I'll step outside. May your day be bright with Yuletide blessings! Don't forget that on December 31 there will be a rare Blue Moon PLUS a partial Lunar Eclipse! High time for magic! Greetings! I'm Tree and this site is my magick inspired blog and paranormal experience journal. It features witchcraft information from the hedge and hearth, haunting ghost encounters, handmade ritual tools such as wands and rattles, Wicca and Pagan information, free spells and amulets to try, plus original art inspired by these topics. "Witch Whats" is also the title of a section in my ArtFire store, where you can shop my handmade Wiccan, Pagan, Neo-Shamanic, and witchcraft goods. 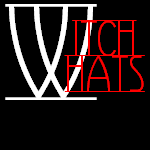 I also made a Twitter connected Facebook Page titled Witch Whats for the comments and posts a bit too small to blog and sharing the little treasures that social media can reveal. I'm an artist & polytheistic solitary Wiccan. Not all Wiccans use magick or spells of any kind, but I do consider myself to be a Hedge Witch as well. For over 30 years I've been in private study & practice of the occult, metaphysical sciences & neo-Paganism with a strong interest in sympathetic magick -- both ancient & modern within world cultures. I enjoy sharing the things that I learn & create, so that is my motivation for creating this site. I've also had quite a few uncommon experiences throughout my life -- paranormal, spiritual, psychic, cryptology, ufology -- a blog is a wonderful way to unpack those memories & possibly gain new insight too. I do my best to write original content for you, and some of the images are my own art work, but I'll let you know resources I may have reference when possible. You may USE the text I write here, but not for profit or personal gain; it's copyrighted so please don't re-post it on your own retail site, don't charge anyone a fee for access to information written by Tree Pruitt, don't change the words around and try to use it as your own in any form other than brief quotation and review or your own personal use. If you use any ideas from this site, such as in "Conjure This" sections, please do share the experience with others. Comments can be posted here under each topic entry. ALL GRAPHICS must be credited to the original owner if copied from this site. Most of the graphics I use were generously offered for free use, with a return link by two main resources or made by myself. It must be said that the reader uses all advise, remedies, or suggestions at their own risk. Always take care when dealing with children in any regards but especially when taking advise from others; use your own discretion. If you feel you have emotional or physical difficulties consult an expert before using herbal or home remedies. Together we learn & grow.